While his IT team seems removed from the patients, they are working right beside the medical staff to protect those who walk through the hospital doors. 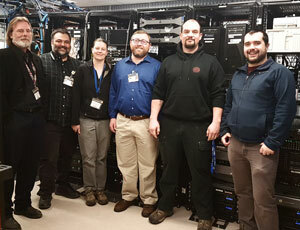 While the medical staff works to prevent diseases and improve patients’ health, Bartilson and his IT team work to safeguard their information. Ransomware is one of the most prevalent types of malware (malicious software) affecting healthcare facilities. This malware encrypts the system’s data, preventing anyone from accessing data unless a ransom is paid. Sometimes, those who pay the ransom are still unable to recover their files. According to the U.S. government document How to Protect Your Networks from Ransomware, the number of ransomware attacks has increased 300%, from 1,000 attacks per day in 2015 to 4,000 attacks per day in 2016. While urban and rural networks are both targeted, rural-based information systems may be at a greater risk in an attack. Rural and smaller facilities may not be targeted more, but rural facilities tend to have less training, resources, and protections in place. “Rural and smaller facilities may not be targeted more, but rural facilities tend to have less training, resources, and protections in place,” explains Joe Wivoda, CIO and HIT Consultant at the National Rural Health Resource Center. For example, urban healthcare facilities may have a large IT team, while rural facilities might have one IT employee who works part-time. Cost is also a barrier for many rural facilities, as it takes financial resources to purchase updated software or hire someone to install a firewall. For some facilities, cybersecurity may not seem like a top priority. An ambulance sits outside of South Peninsula Hospital in Homer, Alaska. As with other healthcare positions, many rural facilities have come to rely on traveling or agency staff to fill vacant positions. While filling an important need, this type of staffing can be an added risk to facilities’ cybersecurity, since these employees might not have completed the same orientation and training as the other employees. These risks make recruitment and grow-your-own efforts for IT staff all the more important for rural facilities. Despite the barriers, rural facilities possess a strength that urban facilities may not. Since everyone tends to know each other in smaller communities, rural healthcare staff may hold themselves more accountable to safeguard their patients’ information from unauthorized access, modification, or destruction. South Peninsula Hospital is one such facility that works hard to safeguard the information of its patients, families, and neighbors. SPH provides primary care, outpatient specialty clinics, and long-term care, along with emergency medicine. The 60-year-old hospital employs over 450 people and serves a population of 13,000 living in a 50-mile radius. You cannot be effective managing security risks unless you have support from your senior leadership and operating board. “We are one of the pillars of the community,” says Derotha Ferraro, Director of Public Relations & Marketing at SPH. “We’ve been here the longest and we’re the largest employer.” This status in the community adds extra incentive for hospital staff to protect their patients’ information. Such an issue would lead not only to compromised information but also liability and downtime. “Liability” refers to the costs associated with a data breach, such as fines, credit monitoring for those affected, and rise in insurance rates. “Downtime” is the time and work lost if a facility needs to shut down or if infected servers shut themselves down. The hospital is constantly bombarded by malware, so Bartilson and his team’s work is never done: “Security systems are no longer set it and forget it,” Bartilson explains. If viruses do occur, the IT team works to find the source and educates coworkers on safe practices so that future attacks can be prevented. The more informed the user is, the stronger the security can be. Prevention is key, not just for the IT staff of six but for anyone who works for SPH. While the hospital uses software programs to safeguard its data, staff members also need to be on the lookout for suspicious-looking emails and attachments. “The more informed the user is, the stronger the security can be,” Ferraro explains. Training occurs during new employee orientation and throughout a staff member’s career. New employees at SPH spend an hour of their orientation learning about cybersecurity. The IT staff offers continual education to the other staff members by sending out alerts and offering videos for refresher courses. You have to train everyone, not just one department, but everyone who touches a computer. This training – teaching staff how to spot suspicious-looking emails and how to back up their files – can be outsourced or found online. HIPAA Training & Resources can be a useful tool, with links to security training games and risk assessment tools. 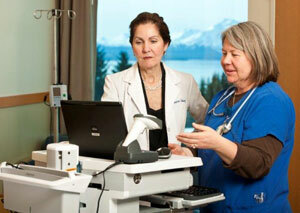 A Chief Nursing Officer and Charge Nurse use a SPH computer. Sometimes, Bartilson and his IT team provide articles about recent data breaches at other healthcare facilities. These articles serve as learning opportunities, as the team then describes what SPH employees can do to avoid a similar situation. In addition to these cautionary tales, the IT team makes sure to recognize coworkers who catch and report suspicious links and emails. This reminds all staff members that they each play a part in protecting the hospital’s information. Bartilson and the team also act as mentors so that their coworkers feel capable of taking on more responsibility with cybersecurity at work and in their homes. 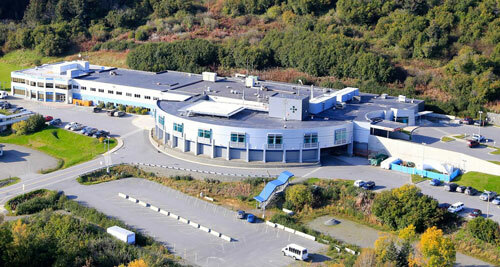 An aerial view of South Peninsula Hospital shows a beautiful but isolated landscape. This entry was posted in Features and tagged Alaska, Critical Access Hospitals, Health information technology, Health information technology workforce, Healthcare workforce, Hospitals, Technology for health and human services on January 11, 2017 by Allee Mead.